Electric Pi Journal: Mac IIci in 2010 - Wickeder fast! When the Macintosh II line evolved in 1989 to 32-bit clean ROMs, the IIci was briefly king of the Apple line. Its Motorola 68030 CPU running at a whopping 25 MHz was unprecedented in speed. Mac IIci, still blazing away, so to speak, in 2010. Note the flock of SCSI peripherals. Click on image for larger view. These lofty headwaters were quickly surpassed as the Mac IIfx was released in 1990. 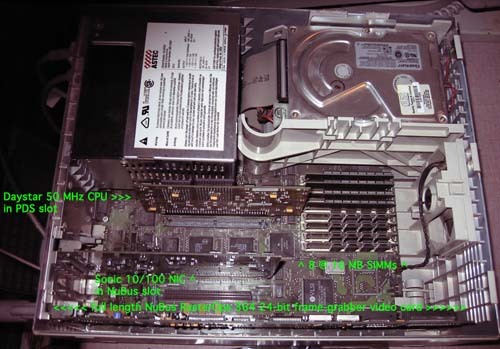 The IIfx it was dubbed "Wicked Fast" by Apple's Product Manager, Frank Casanova, due to its awesome 40 MHz processor, making it the swiftest PC on earth. But at $9,900 MSRP for the IIfx empty desktop box (no RAM, no hard disk drives, and no video card -- all extra cost components), others griped that the "fx" referred to it being "too f-ing expensive." 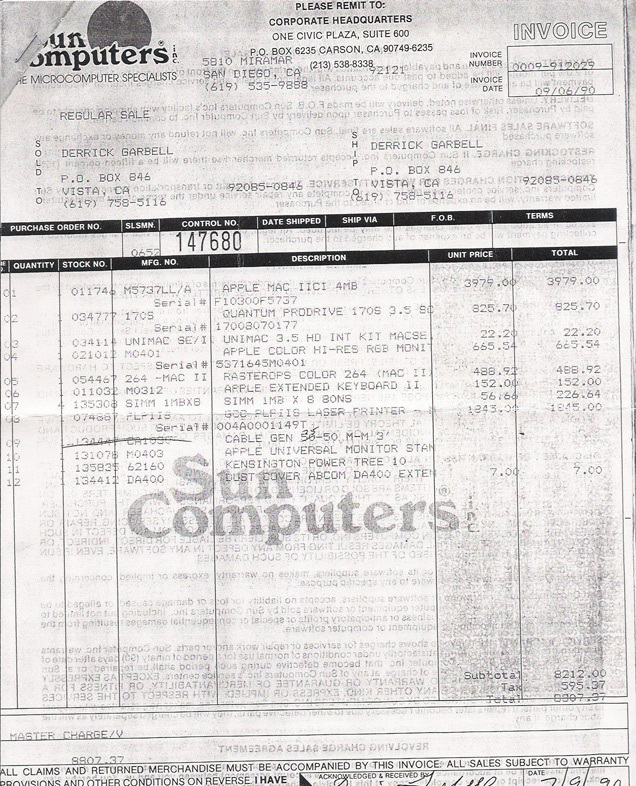 Invoice for Mac IIci. Click for larger view. 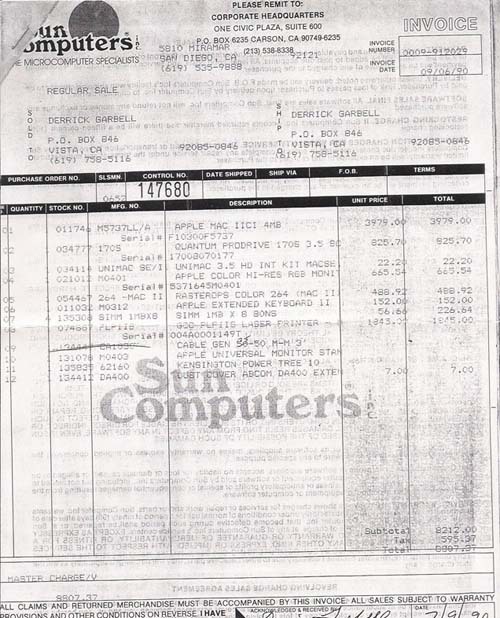 My first personal computer was a Macintosh IIci, bought late 1990. Fully equipped with laser printer, color display, and other accessories, it cost over $10,000. I wanted the IIfx, but my wallet already was depleted. I still have that venerable Mac IIci in working order, upgraded over the years with many excellent components and peripherals, some bought, some donated. It now sports 128 MB system RAM, the maximum in its eight SIMM slots; a RasterOps 364 24-bit video card, originally a $1,700 retail item due to its video frame-grabbing capability and 1 MB+ VRAM; a Sonic 10/100 Ethernet card, a 1 GB SCSI disk drive, and several external daisy-chained SCSI-based peripherals: a 4 GB SCSI hard drive; a Pioneer 32x CD-ROM; SyQuest 44/88 MB & 105/270 MB cartridge drives; Agfa color scanner; HP grayscale OCR scanner; PLP IIS 300 dpi laser printer (yes, this is a printer with a SCSI interface, far quicker than the AppleTalk network printers of that era). 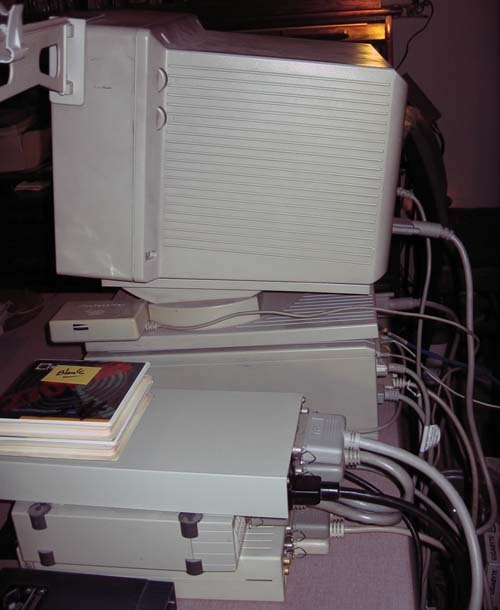 Its serial ports still accommodate a MacVision video digitizer (for VCR & older video camera input), a MacRecorder audio-mic digitizer, and a V.92 US Robotics V.Everything fax-modem. The monitor is an original Apple 13" RGB Trinitron, and the keyboard is the Apple Deluxe with colored logo, which even after 20 years still better be working, considering its $152 original price tag. Interior of Mac IIci with cards. Click on image for larger view. 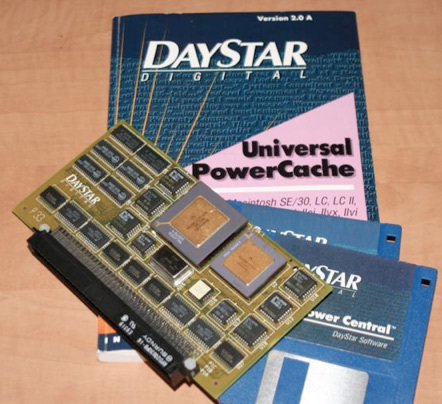 But yesterday I was gifted with what many would regard as the jewel of upgrades: a DayStar Digital Universal PowerCache #P33 68030 50 MHz accelerator. This CPU upgrade fits in the IIci's PDS slot, replacing the old Daystar 32 kb Level 2 cache card. 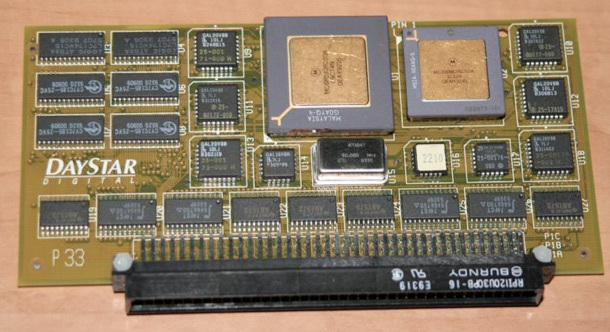 The Daystar 50 MHz card incorporates its own 32 kb L2 cache on board, so that feature was not lost. 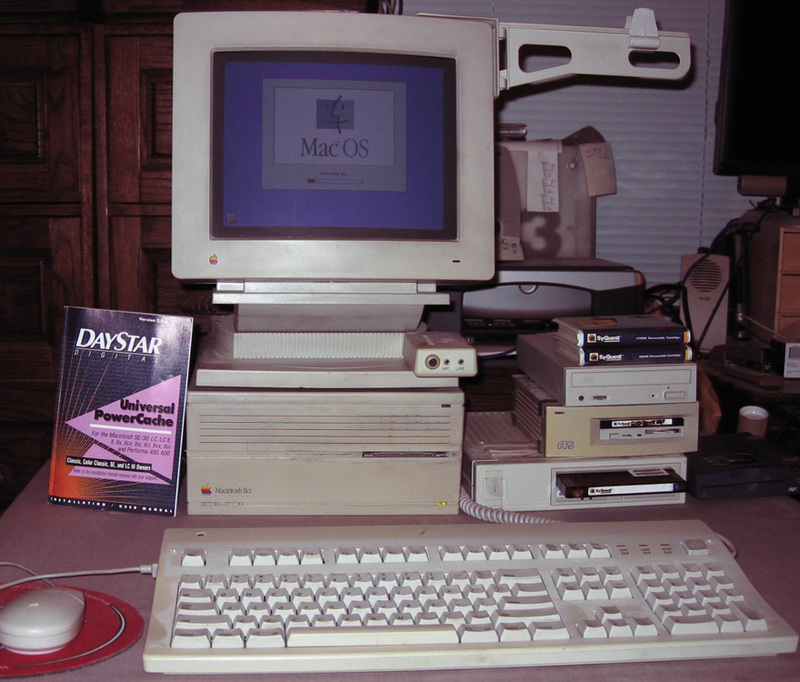 DayStar Digital card: at one time the Indy racecar of the Mac world. Drop the accelerator card in the slot, reboot, and the new CPU was operational, as it was driven by the same Daystar Power Central Control Panel as the supplanted L2 cache card. DayStar card manual. Real, printed manual! The speed increase is noticeable whether the Mac is running System 6.0.5 or 7.6.1 (we swap between 2 hard drives to visit each OS). Although there were also Quadra accelerator cards offered for the Mac II lineup, having this 68030 model allows for full retro-program compatibility, as there are numerous known 68040 glitches. So now my first Mac can justifiably be called "wickeder fast," as it surpasses the IIfx by 10 MHz. You may drop to one knee and humbly mutter, "We are not worthy!"